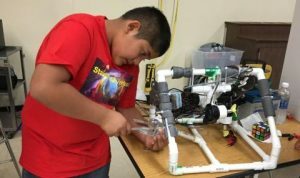 LINCOLN CITY, Ore. – About 150 students in Oregon and Washington from elementary school through college will compete in Lincoln City on April 20 in an underwater robotics contest that tests their engineering and problem-solving skills. The 27 teams, which hail from 13 schools or organizations in 14 towns, will be showing off the remotely operated vehicles – or ROVs – they built for the annual MATE Oregon Regional ROV competition. The event is funded by Oregon Sea Grant and the Oregon Coast STEM Hub and aims to prepare students for technical careers. The public is invited to attend the contest, which will be held from 9 a.m.- 5 p.m. in the swimming pool and gym at the Lincoln City Community Center at 2150 N.E. Oar Place. The Oregon teams come from Albany, Astoria, Beaverton, Corvallis, Lincoln City, Newport, The Dalles, Tigard, Tillamook, Toledo and Warrenton. The Washington teams are from White Salmon. The college students are from Oregon State University and Linn-Benton Community College. Teams are divided into four categories based on skill and grade level. The event is one of 38 regional contests around the world that are coordinated by the California-based Marine Advanced Technology Education (MATE) Center. The top high school and college teams will qualify to compete in the MATE International ROV Competition, which will be held June 20-22 in Kingsport, Tenn.
Students are tasked with creating mock companies, building a robot for a hypothetical client, and thinking like entrepreneurs to market their products. They gain project management and communication skills as they manage a budget, work as a team, brainstorm solutions and deliver presentations. Each year a new theme is chosen. This year’s contest highlights the role of ROVs in ensuring public safety, maintaining healthy waterways and preserving historical artifacts. The students must guide their devices through tasks that simulate inspecting and repairing a mock hydroelectric dam, monitoring water quality, restoring habitat for fish and recovering a hypothetical cannon from the Civil War. The latter task is only for the upper two levels. Students will also present marketing displays they created and give presentations to judges about how the built their device. The judges and volunteer divers come from Oregon State University, the National Oceanic and Atmospheric Administration, the Environmental Protection Agency, the Oregon Department of Fish and Wildlife and the Oregon Coast Aquarium. 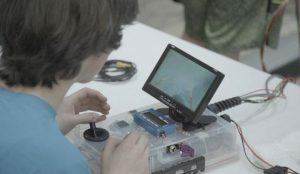 The MATE Center, the Marine Technology Society, the Association for Unmanned Vehicle Systems International, and The Sexton Corporation also support the competition. The contest is one of many events offered by the Oregon Coast STEM Hub and Oregon Sea Grant to develop Oregon’s future workforce by helping students increase their competency in science, technology, engineering and math. Wheeler, Oregon – Wow! On Saturday, March 9th, more than a 170 volunteers showed up bright and early for the 11th Biennial Nehalem Estuary Cleanup. 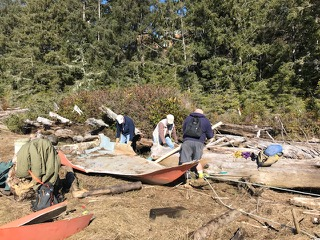 Volunteers from the community and beyond pitched in by cleaning debris from the mud and high tide line, sorting through trash and recyclables, helping with set-up and take down, working morning registration, and hosting the celebration dinner. The amazing contributions from the community and the amount of debris removed show how much this event means locally. Participants pulled nearly two tons of trash, 10 tires, and an assortment of recyclables from Nehalem Bay. Some other notable items included a plastic playground slide, half a canoe, several hundred shotgun shells, 4 chairs, 32 assorted balls, 2 refrigerators, 1 fluorescent light bulb, 5 plastic joint containers, 4 tree protectors, an old boat, and one volunteer walked away with a matching pair of sandals just in time for summer! The 2019 Clean-Up Celebration at the White Clover Grange also featured the first “Art in the Watershed” display with art by students from Nehalem Elementary School. These students were given a prompt to illustrate what they valued about the watershed. The winners were on display at Manzanita News and Espresso throughout the month of March and will now be used to for T-shirts for the Lower Nehalem Watershed Council. Thank you to the Art Parents of Nehalem Elementary School and to Lower Nehalem Watershed Council Board Member Will Russell for bringing watershed science into the classrooms. Community partners Lower Nehalem Watershed Council, Lower Nehalem Community Trust, Nehalem Bay State Park, North Coast Land Conservancy, and Tillamook Estuary Partnership are incredibly thankful to the outpouring of support from volunteers, local business, and community members. The success of this event wouldn’t be possible without the dedication, commitment, and hard work of so many. We owe each and every one of them our appreciation for helping to make the Nehalem estuary a clean and healthy place for wildlife and people. We are especially thankful to our wonderful cash sponsors and in-kind donors: They are, in alphabetical order, B Good Bars, Bill’s Tavern, Bob and Charlotte Forster, City of Nehalem, City of Wheeler, Fort George Brewery, Handy Creek Bakery, Kingfisher Farm, Lewis and Clark Timberlands, Little Apple Manzanita Market, Manzanita Beach Getaways, Manzanita Fresh Foods, Manzanita News and Espresso, Mother Nature’s Natural Foods, Nehalem Landing, North Coast Land Conservancy, North Fork 53 CommuniTea, Oregon State Parks, Port of Nehalem, Recology, Salmonberry Saloon, Sister And Pete’s Coffees and Treats, SOLVE, Tillamook County Solid Waste, Tillamook Estuaries Partnership, Wanda’s Café, Weyerhaeuser Columbia Timberlands, and Yolk. 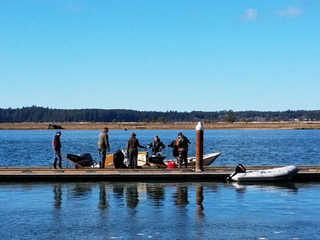 We’re proud to say that this year’s Nehalem Estuary Cleanup was another expression of this community’s dedication to the estuary. With another event in the books, we look forward to partnering with you all again in 2021! Don’t do it for yourself; do it for the birds and the bees. Native plants – those that occur naturally in a region in which they evolved – are the foundation of natural ecosystems and help protect biodiversity. Native plants help support local pollinator habitats – and that means more birds and bees living healthy, happy and well fed. Which is why the Tillamook Estuaries Partnership is hosting a native plant sale and potting party on April 20 at their NW Oregon Restoration Partnership Nursery from noon to 3 pm. “Our development of infrastructure has fragmented populations of native species, making it harder for our bees and butterflies and moths to find appropriate sources of nectar,” said Maysa Miller, TEP’s NW Oregon Restoration Partnership Coordinator. “When you plant native plants in your yard and garden, you are creating corridors for native pollinators and forage habitats for bird species,” she added. Native plants are grown at the NORP Nursery for distribution among local, state and federal organizations to help with restoration projects – such as the Hoquorton Slough, and the Kilchis Nature Conservancy Project. “Whatever plants do not go to restoration projects we try to turn over and make them available to the public,” Miller said. 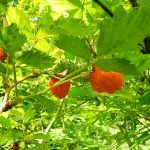 Plants like Cascara, Black Twinberry, Pacific Ninebark, Salmonberry, Red-osier dogwood, Rose Spirea and more– all available for $4 a plant. But don’t just come pick out a plant; learn the best plants for incorporating into your landscaping and take a guided tour of the nursery facilities at 1 p.m. And, get your hands dirty during a family-friendly potting party. Help transplant some of TEP’s stock for use in habitat restoration projects throughout Northwest Oregon. This is a special opportunity where minors are welcome at the nursery. Registration for the event is required at explorenaturetillamookcoast.com. This event is free and are part of the Explore Nature series of hikes, walks, paddles and outdoor adventures. Explore Nature Series events are hosted by a consortium of volunteer community and non-profit organizations, and are meaningful nature-based experiences highlight the unique beauty of Tillamook County and the work being done to preserve and conserve the area’s natural resources and natural resource-based economy. They are partially funded through the Economic Development Council of Tillamook County, Visit Tillamook Coast and the Travel Oregon Forever Fund. Learn more at www.explorenaturetillamookCoast.com. The Bay City Arts Center has announced an extension to the deadline for entries to this year’s songwriting contest to May 15th, acknowledging the great loss of the contest’s founder, Joe Wrabek. It was also announced that Tillamook’s Fairview Grange has joined forces with the Arts Center to share in the volunteer work that will go into producing the event. The new partnership was formed in recognition of Joe’s dedication to both institutions, and will help to ensure that the contest has a sturdy foundation for years to come. The one-month extension will allow the two community arts organizations to do more public outreach, and give songwriters more time to prepare and submit their entries. The annual contest will now be called the “Joe Wrabek Memorial Songwriting Contest.” Under the new partnership, the annual Finals Concert and Dinner will be held at the Bay City Arts Center in odd-numbered years, and at the Fairview Grange on even-numbered years. This year’s finals will be held at the Bay City Arts Center on Saturday, June 8th from 5:30PM to 8:00PM. The Joe Wrabek Memorial Songwriting Contest invites songwriters to submit 3 original songs which will be reviewed and scored by a panel of judges. This year’s contest has two categories: 1) Best Song; and 2) Best Highway 6-themed Song. Each category carries a $500 grand prize, and songs can be entered in one or both categories. Entries must include a CD or thumb drive containing performances of the songs in MP3 format, as well as printed copies of the lyrics and a biography of the songwriter(s). All entries must be delivered to the Bay City Arts Center by 5:00PM on May 15th, and can be mailed to P.O. Box 3124, Bay City, OR 97107, or to the street address found on its website: www.baycityartscenter.org. The intention is for the submitted songs to be performed at the June 8th Finals Concert and Dinner. Performances at the finals will be limited to two musicians each—no full bands for logistical reasons. The public and all entrants are invited to attend, with a suggested donation of $10 per person which will include a lasagna dinner. For more information, contact Hope Montgomery: hope.montgomery04@gmail.com or call the Bay City Arts Center at 503-377-9620. TILLAMOOK, Ore.—Visit Tillamook Coast is proud to announce that the North Coast Food Trail (NCFT), after a successful first year, has expanded its membership to 75 total participants. The food trail was the first of its kind in the state, and has served as a model for others. The 75 businesses stretch from Cannon Beach to Gleneden Beach and include farms, farmers’ markets, breweries, wineries, distilleries, restaurants, cafés, cooking schools, guided tours and experiences, lodging and retail stores. The new food trail members are: Stephanie Inn & Restaurant (Cannon Beach), Wayfarer Restaurant (Cannon Beach), Public Coast Brewing (Cannon Beach), Grateful Bread (Pacific City), Old House Dahlias (Tillamook), Beachcrest Brewing Company (Gleneden Beach), Blue Heron French Cheese Company (Tillamook), Debbie D’s Sausage (Tillamook), Five Rivers Coffee Roasters (Tillamook), Garibaldi Roasting Company (Garibaldi), Pacific Edge Espresso (Garibaldi), JAndy Oyster Company (Tillamook), Moon River Farm (Nehalem), Neskowin Trading Company and Beach Club Bistro (Neskowin), Netarts Bay View Cabins (Netarts), Olde Line Lanes (Lincoln City), Oregon Coast Tours and Transportation (Pacific City), Sand Dollar Restaurant and Lounge (Rockaway Beach), Sportsman’s Pub and Grub (Pacific City), Tillamook Meats (Tillamook), Trent Family Farms (Cloverdale), Werner Beef & Brew (Tillamook), and Zweifel Farms Eggs (Tillamook). Visitors can have a diverse range of experiences from any in-bound highway, from Highway 26 in the north to Highway 18 in the south. A map with each participating business is available online, as well at visitor centers and participating businesses. 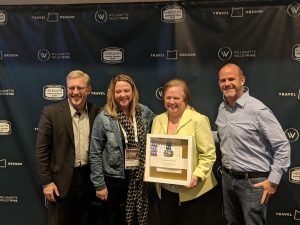 On Sunday, April 14, at the Oregon Governor’s Conference on Tourism in Eugene, Travel Oregon announced that Visit Tillamook Coast and the North Coast Food Trail won the 2018 Oregon Niche Tourism Award, recognizing outstanding accomplishment. Visit Tillamook Coast was recognized for their leadership in the development of the NCFT, food events such as Crave the Coast and Beer + Cheese, and the numerous benefits the trail brought to coastal businesses. Travel Oregon CEO Todd Davidson (far left) and Oregon Tourism Commission Chair Ryan Snyder (far right) present Nan Devlin (inner right) and Julie Hurliman (inner left) of Visit Tillamook Coast with the 2018 Oregon Niche Tourism Award. Visit Tillamook Coast would like to recognize all their partners and collaborators on the NCFT and these events: Travel Oregon, Cannon Beach, Lincoln City, Food Roots, Port of Garibaldi, Meet Green and all the trail participants. For more information, call (503) 842-2672 or email nan@tillamookcoast.com.